so said ellie: The bees knees. 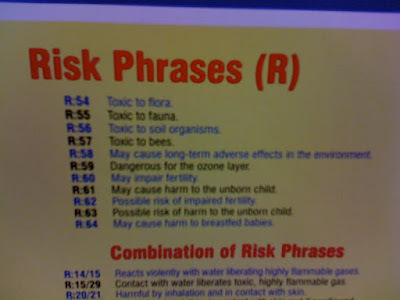 I never would have imagined that there was an entire category of risk dedicated to bees. Obviously if you think about it, bees are very important, pollination and all that. I learned this from Bee Movie, thank you Jerry Seinfeld*, but wow, a dedicated risk phrase. I had a look at ChemAlert, and just for your reference, if you are a lover of bees you should steer well clear of organophosphates. *Although there is a good chance that I already knew the environmental importance of bees as pollinators and didn't need it condensed into moralistic cartoon form, but damn, I liked that movie.